I hope that everyone has made it safely through all these crazy storms. Easter baskets have taken over the shop! I have lots of fun Easter Baskets in the shop – all at discounted prices and all festive and ready to give! The pic shows just a few of them. 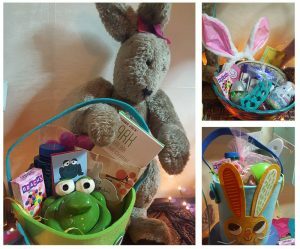 Prices range from $10 – $50 and of course I have all sorts of great basket stuffers. There are approximately 16 million Americans suffering from Rosasea according to the National Rosacea Society (NRS). So what can be done to help? Use items that are calming and cooling to the skin. Saucy Chica has a Cucumber Wash, Colloidal Silver Toner and Chamomile Moisturizer that are all calming. Also, we can do calming facial treatments to help your skin. For a nice calming, hydrating, antibacterial mask, simply use some local honey. Put the honey in a small bowl and place it in a larger bowl of hot water so that the honey can melt just a little bit. It will make it easier to spread. Apply the mask and let it sit for 15 mins. This is such a simple mask and so gentle you can actually do it every day. Ice is also your friend, you can soak compresses in cool water and place on the skin. Try to avoid or limit steam as much as possible. 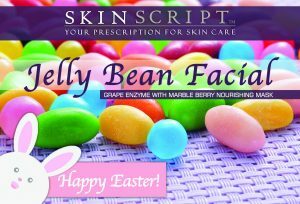 Grapes and Marble Berries come together this spring in a unique anti-aging, antioxidant nourishing facial. Antioxidants feed our skin cells to create glowing, radiant skin. The sweet-smelling Grape Enzyme in this protocol looks and feels just like the inside of a grape. Grapes are rich in antioxidant polyphenols and offer anti-aging preventative benefits, while papain offers mild exfoliation. The Marble Berry Nourishing Mask will nourish and firm the skin, resulting in a beautiful, healthy glow. The Marble Berry mask is an antioxidant-rich mask to treat and hydrate the skin. It will be a great anti-aging, nourishing facial. The Grape Enzyme contains only gentle enzymes so it is perfect for all skin types. Marble Berry is designed specifically for aging and parched skin. This unique purple cream mask has natural botanicals of olives and black rice bran which is sure to leave skin feeling and looking refreshed and healthy. The mask also helps to protect and oxygenate the skin, leaving it looking youthful and clear. April 12th – Paris Mountain Guided Nature Walk from the Women’s Social Business Group. My friend Jaidra will be leading us on a less-than-two-mile hike around Lake Placid and part of Turtle Trail in Paris Mountain State Park. We did a hike with her last year and it was really interesting to learn about local plants and microclimates. Get more info and RSVP on Facebook. April 21st – Bourbon Tasting! Because no great story ever begins with eating your veggies…….Libations for Leukemia at Craft and Barrel. Come join in a fun evening of Bourbon (Jim Beam double oak , Jim Beam Black, Makers 146 and Knob Creek Rye) and your choice of flat bread pizza – Pesto & Heirloom Tomato, Buffalo Chicken, Classic Pepperoni or BBQ Chicken. The tasting will be from 7 to 9pm followed by live music from Dion Sweatt, a Rock & Blues band. A portion of all ticket sales will go to The Leukemia Lymphoma Society. The cost per person is $25 and can be purchased through the link on the Facebook invite. It would help to please pay ahead of time so we know how many people to prepare for. Thanks! April 25th – This will be a discussion about Women in Islam at the Istanbul Cultural Center. Do you have questions about women’s roles in Islamic society? We are still working on exactly what this will be but for sure mark your calendars for that evening and come prepared with questions. Look for more info on Facebook as we have it.